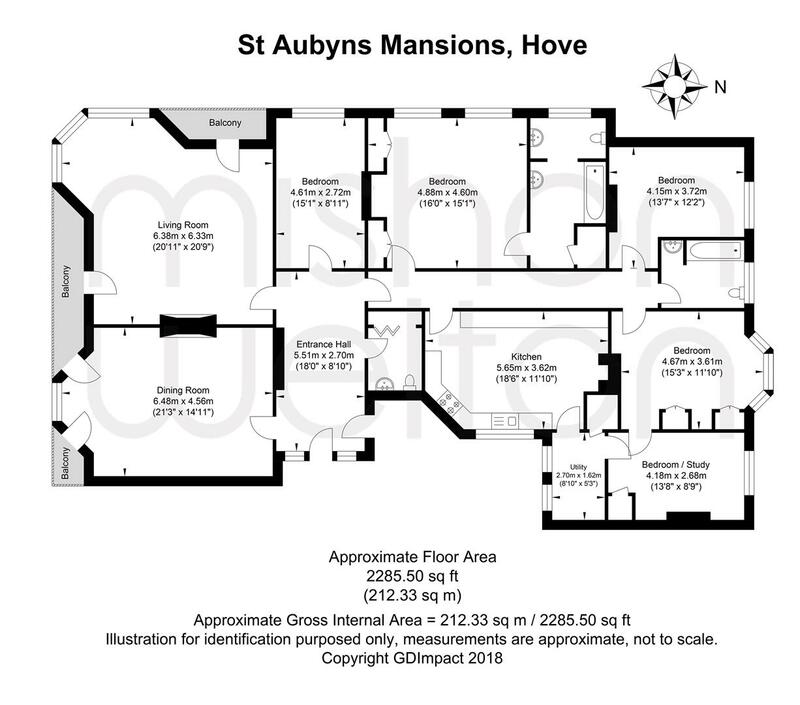 A RARE OPPORTUNITY to acquire this truly MAGNIFICENT FIVE BEDROOM FIRST FLOOR mansion apartment situated in one of Hove’s most sought after and PREMIER LOCATIONS which is St Aubyns Mansions. With glorious DUAL ASPECT views across the TWO STUNNING BALCONIES this home boasts in excess of 2,285 sq ft. The entrance to this prestigious building is both welcoming and impressive boasting elegant communal hallways with beautiful curved staircase and an original style caged lift. The apartment itself has a generous entrance hall that leads to a substantial living area with impressive high ceilings with decorative cornices and stunning direct views to the sea. This generous room really does offer the wow factor and has access to two private balconies. It is the perfect place to unwind and watch the world go by. The separate dining room is equally as grand with access to a third balcony and beautiful period features. The kitchen is well proportioned and benefits from a useful utility room. These rooms offer fantastic potential for the new owner to put their own stamp on this wonderful home. The master bedroom is impressive with built in storage and has the luxury of an en-suite bathroom with separate WC. There are four further bedrooms and a family bathroom which comprises of a bath, shower over the bath, hand basin, wc and the added opulence of a private steam room . There is also a further separate wc. In need of modernisation, this is a fantastic piece of prime Hove real estate. Situated in an idyllic location this really is a must see and viewing is highly recommended! The property is positioned on Hove’s iconic seafront on Kings Esplanade. The popular Church Road is within very close proximity with an extensive range of independent shops, cafes, bars and restaurants. Hove railway station is close by providing excellent transport links for commuters.